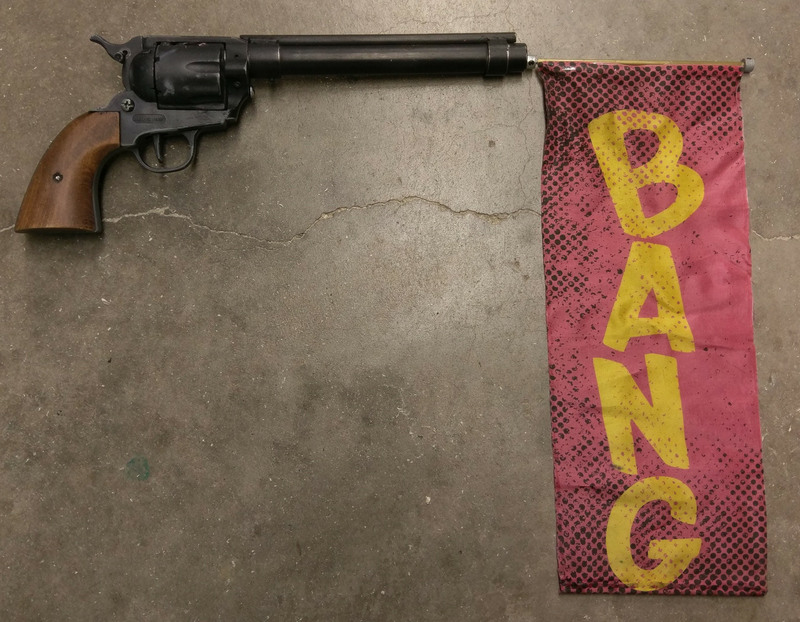 The director and scenic designer wanted a gun that shoots out a banner that says “bang”. They wanted a banner that was larger than the common version you can get from a party/gimmick store. The team also wanted something more realistic looking. The project started with an extra gun from stock. The barrel was cut off and replace with a tube that was longer with thinner walls to accommodate the spring and rolled-up banner. A slot was cut in this tube to keep the mechanism in line and not shooting across the room. The inside end of the banner rod has an impact hex head that is held in place with an impact adapter (similar to what is at the end of the impact tool). The old cylinder was cut apart to hid the impact adapter ad the back of the gun. The gun’s trigger would activate the gun’s hammer which then released the hex head from the holder. The banner would be pushed out by the spring and then would unroll. Overall the gun was successful. A few times the gun would jam up. Some of the reason was the spring strength and using readily available parts. Having access to a metal lathe at the time of construction would have helped make more custom parts. Actor showing how the gun was used during the show.